Quarter-Finals best of 9 sets 11 January. Semi-Finals best of 11 sets 12 January. Final best of 13 sets 13 January. Jeffrey Van Egdom First Round best of 3 sets 5—9 January. Quarter-Finals best of 3 sets 10 January. Semi-Finals best of 3 sets 11 January. Final best of 5 sets 12 January. Aileen de Graaf Fair play to Humphries though. Hope Smith doesnt get upset aswell now. Man, I wish I could get more of my friends into this in the US. I think the timing shift hurts it but god, this is such an incredible sport. 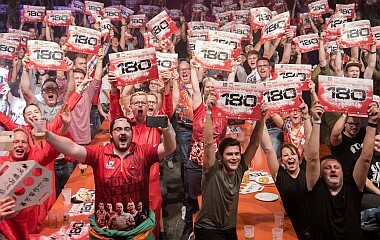 Just curious, how much does the pdc make from the fans at a single session at ally pally. This includes tickets and beers etc. Anyone know what was happening with the crowd those last couple games? At certain points more than half the audience were looking and chanting at the back left of the Ally Pally, completely ignoring the darts. There was some clown dressed as Peter Wright dancing around and getting the crowd to chant. Imagine buying a ticket for Ally Pally and spending the full session chanting at someone dressed as Peter Wright. There was also a good amount of back and forth chants between the tables and the seats crowd. Nothing that awful really, had some awkward celebrations but in fairness I think he won a set at that time. But the handshake at the end was unsportsmanlike. He purposefully stopped his walk to get the darts to cheer in front of his face it was so cringey Joyce just laughed t off. Wade has acted bad or unsportsmanlike on stage many times. However the antics against Asada recently really turned public opinion against him. Has been like this for the whole tournament. That side of the bracket was really open and I expected either he or Mervyn King would end up in the quarters because of it. Apparently Anderson has back problems again so if thats the case I dont see him beating MvG at all. Great fightback from Aspinall. What a contrast seeing Alcinas-vdPas and then in the same session Lewis losing with a average Anyone watching on DAZN? Maybe they only have permission from sky sports or whoever to air the match and not the interviews? MvG is too good but Lewis has had a good redemption year after the R1 upset and pushing incident. Hope he can continue in if he goes out here. Before the tournament he wasnt great form but after watching his games vs Reyes and especially De Zwaan, hes the strongest player in the bottom half by far. Smith is very good but a bit of a choker as well. Cross is the opposite, he raises his game with more pressure on him. Henderson was in the zone. Almost went for another treble 20, then realized that would have been a mistake considering his score. As far as I can tell you can only find the sessions on youtube but with Dutch commentators.